I’d had to take the stock brake/tail light off when I mounted the rear winch right where it had been. Then the rear accessory recievers, and the bumper, and it left very little realestate for putting it back– Especially since it’s bulb housing is 4″ off the back of the light… It needs 6″ depth where I had rack cross bars at. Had bought a 2″x3″ trailer marker light for this, but even it was a bit big to fit in the space I had left, and too thick to end up behind the bumper face. Then, I remembered the marker lights that came with my big trailer, that were left over when I cheated and mounted reflectors instead. 1″x4″. Perfect for between rack and bumper, recessed from bumper face. Just so happens that the space between the frame rails there is 9.75″. Perfect for 2. Made a mount bar from 1″x3/32″ 1095 bar stock. 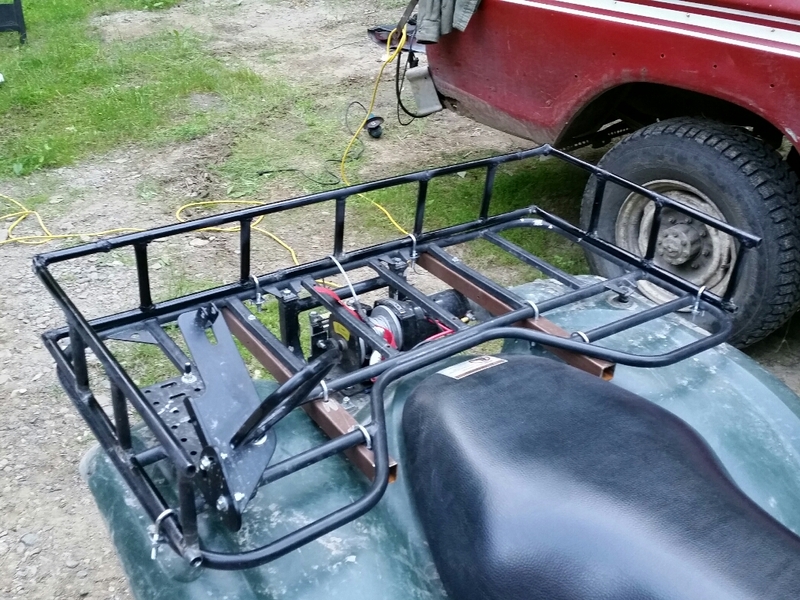 Paint, mount lights, and mount between the frame rail tails with the upper bumper bolts. These lights are nice. They’re a base plate that mounts and wires, then a sealed water proof 2 bulb unit plugs/snaps onto the top. Should be easy to change when burnt out, but being sealed I can’t see them ever burning out very easilly. I wired it to the brake light circuit, intending to later add another couple lights under the rack as constant on taillights. Anyway, they’re pretty bright, here they are with the park brake locked, in daylight, on a bright sunny day.